The whispering muse and the worms of hell. Experiments on extraterrestrial gardening. A workshop lead by Cyborgs Moon Ribas and Neil Harbisson, Ishmael Butler of Shabazz Palaces and Nelly Ben Hayoun, as part of ‘TALLER MUTANTE’, a week of investigating extraterrestrial gardening. 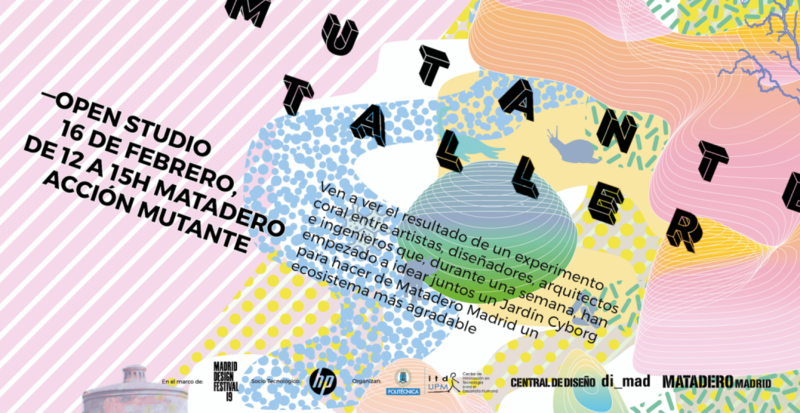 Matadero Madrid and DIMAD organize the Taller Mutante project , an intensive week of workshops at the Central de Diseño, which is proposed as a phase of the “Matadero Acción Mutante” project, an initiative to design a cyborg garden in Matadero that will involve an international group of artists, designers, scientists, technicians and cultural and municipal institutions, among other agents, in a process of at least two years. For this workshop you will work with techniques inspired by automatic writing, thinking, reading upright and producing like in the peripatetic school. You will be asked to join us in a multidisciplinary journey, helping us collecting materials for the production of our E.T garden, planning for our expedition into the sky in the basket of a hot air balloon so we can map out the atmosphere and understand it, floating through the clouds above a deforested area, surrounded by whispering muses as we produce our next garden. Join us if you are in Madrid! For more information, you can follow the link here!